Tampan, Paminggir people. 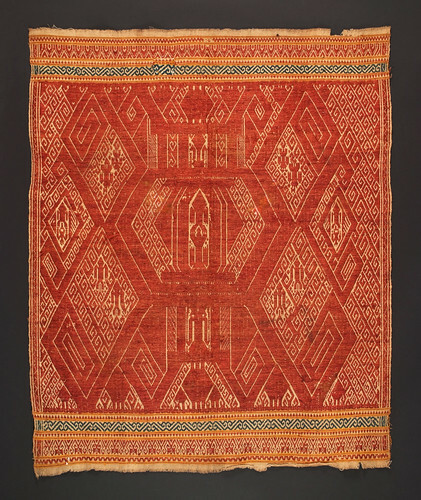 Lampung region of Sumatra, pasisir style, circa 1900, 74 x 90 cm. From the collection of Adam Malik Jakarta. Photograph by D Dunlop. Enthalpy is conserved when compound quarks are formed or decomposed because quarks are indestructible and the enthalpy is defined by sums and differences of quark coefficients. Sensory Interpretation: Thermodynamic quarks and chemical quarks are objectified from thermal, visual, somatic and taste sensations. And the internal energy is defined by the magnitude of a perception. So enthalpy characterizes an awareness of the magnitude for all these sensations, net left-side from right. Next step: building quark models of particles.